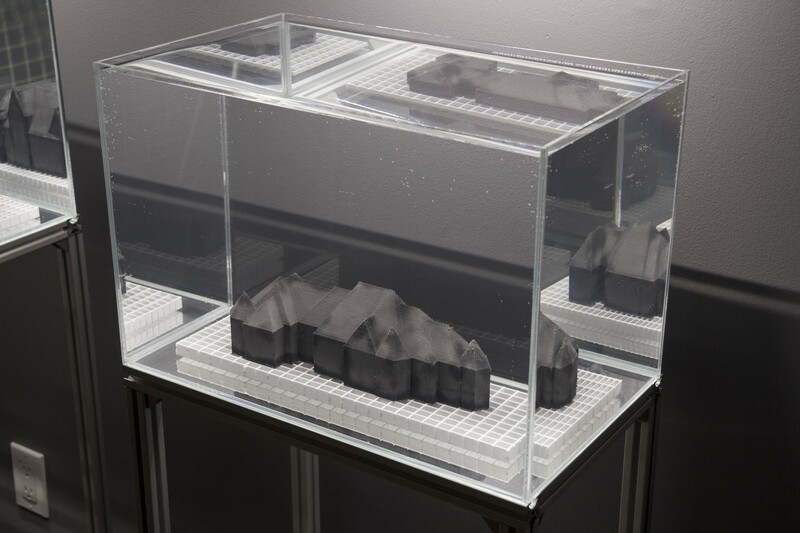 Opens Thurs, Nov 6, 2014 /// 7-9 p.m. 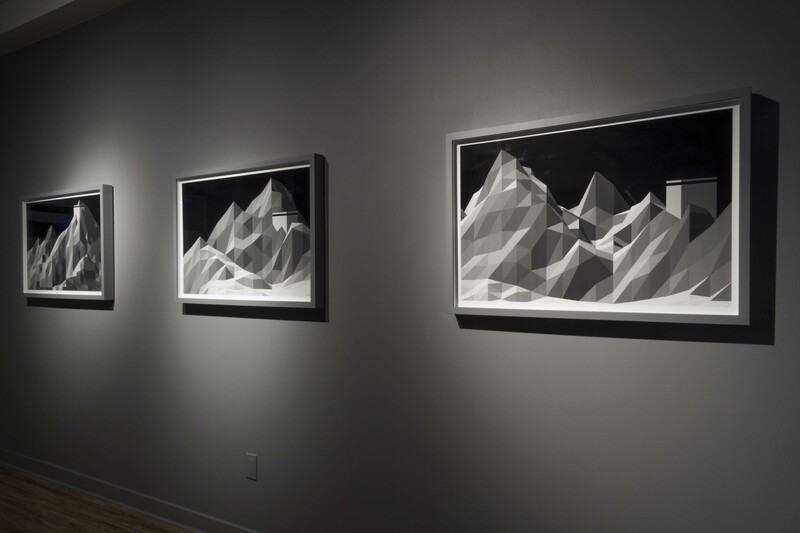 Hours: Tues 6-9 p.m. /// Sat 1-5 p.m.
For inquiries, please contact Wil at 778 229 3458 or wil@WAAPart.com. 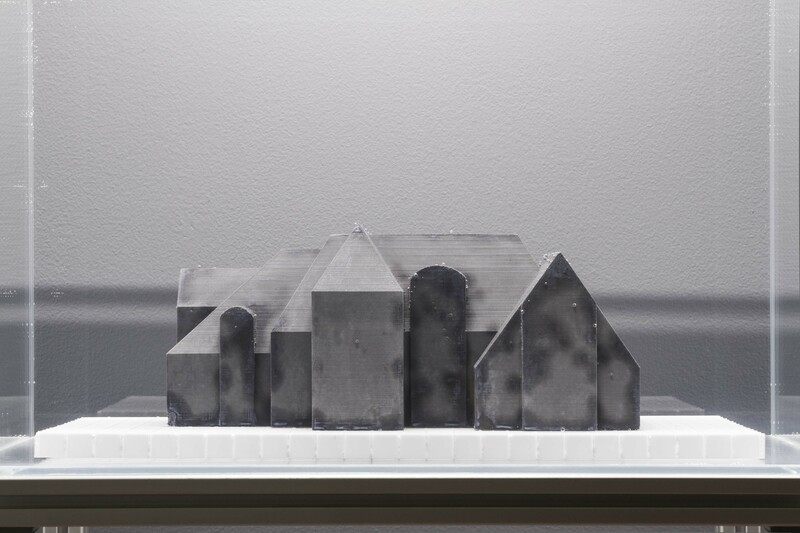 Nicolas Sassoon’s first solo exhibition at WAAP features three recent projects navigating the artist’s current production of fantasized landscapes and architectures through the use of 3D modelling and computer graphics. 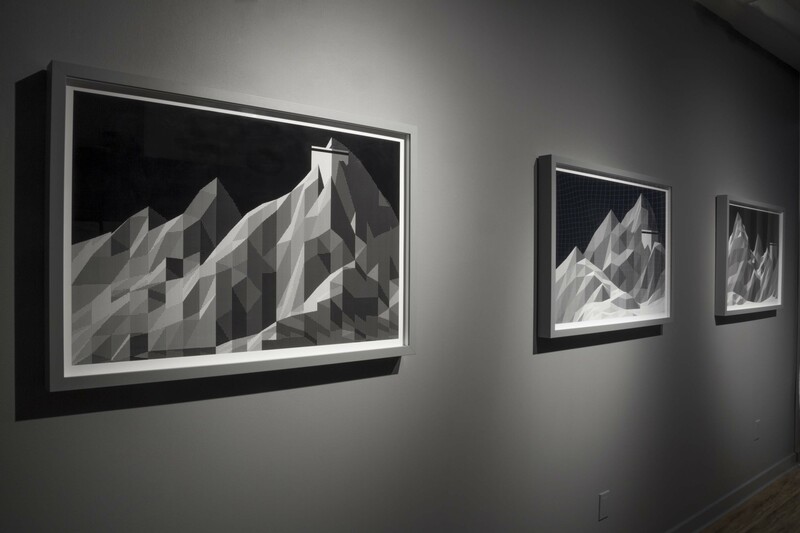 The print series Homelands presents a set of computer generated landscapes inhabited by architectural figures. 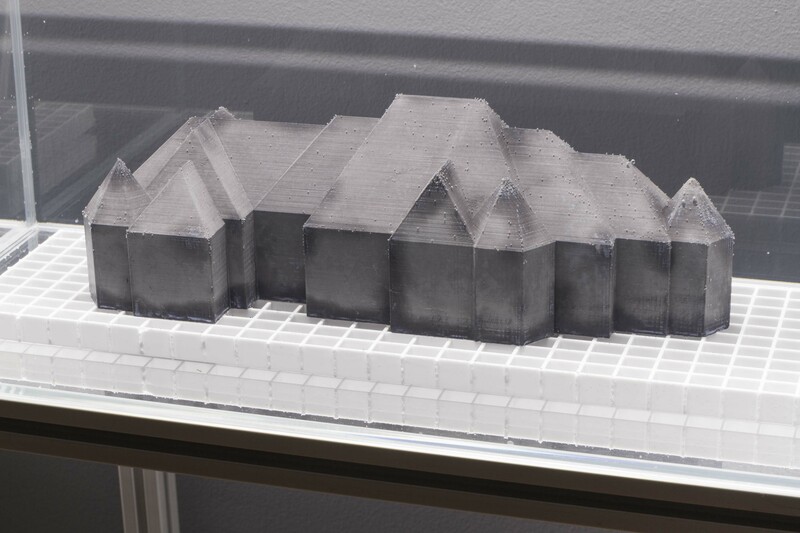 Each print formulates a topographical site for an architecture through the use of landscape generating programs and color-indexing image treatment. 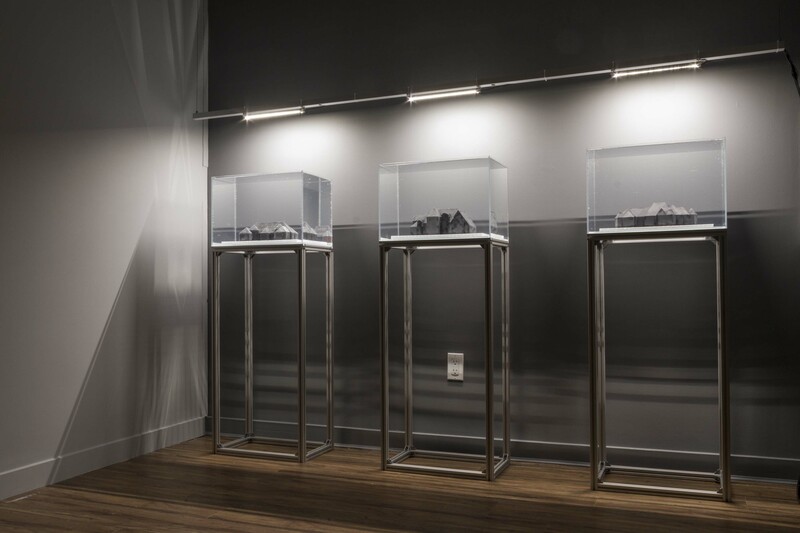 Using this process, the artist creates a large body of bare and secluded landscapes converging towards the sculptural and pictorial qualities of the geography in relation to the architecture. 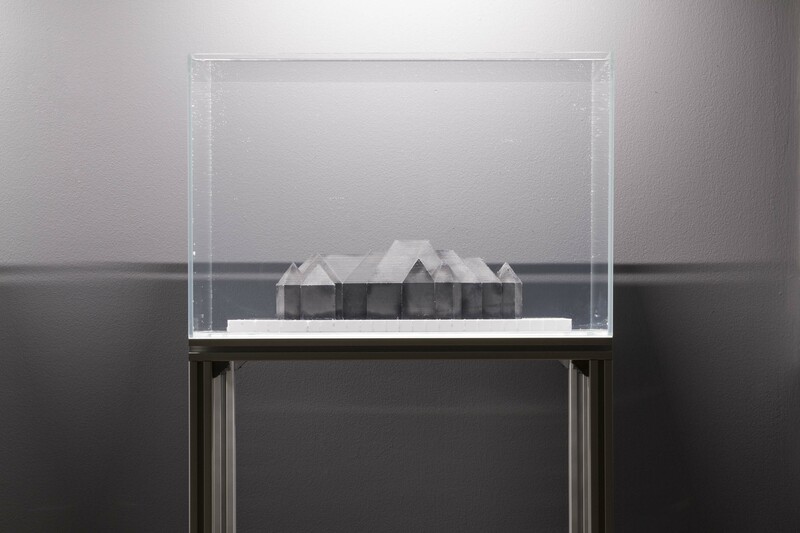 The project Homelands started as an exercise to render some of Sassoon’s father’s fantasized images of holiday homes. 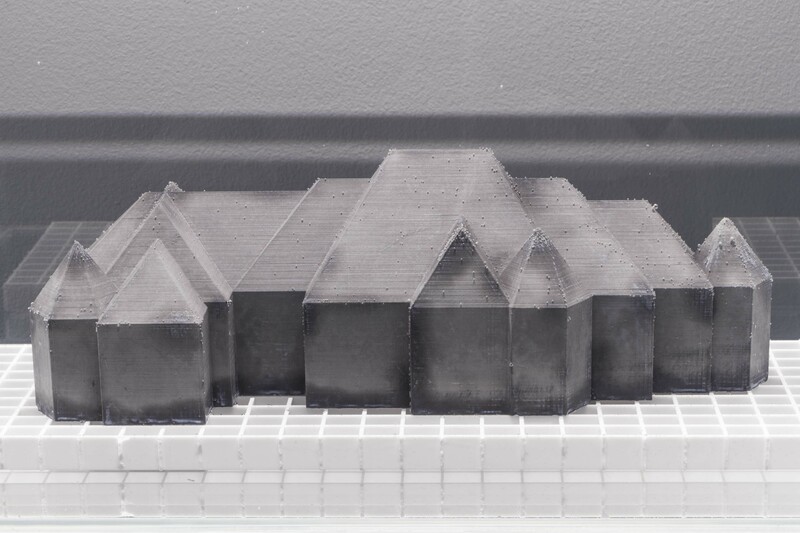 It later became a personal project as an ongoing enquiry on the digital manifestation of architectural fantasies. 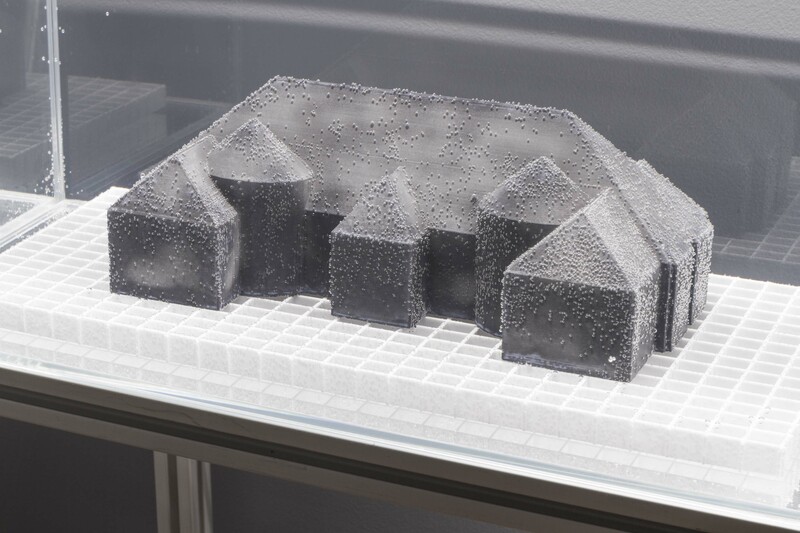 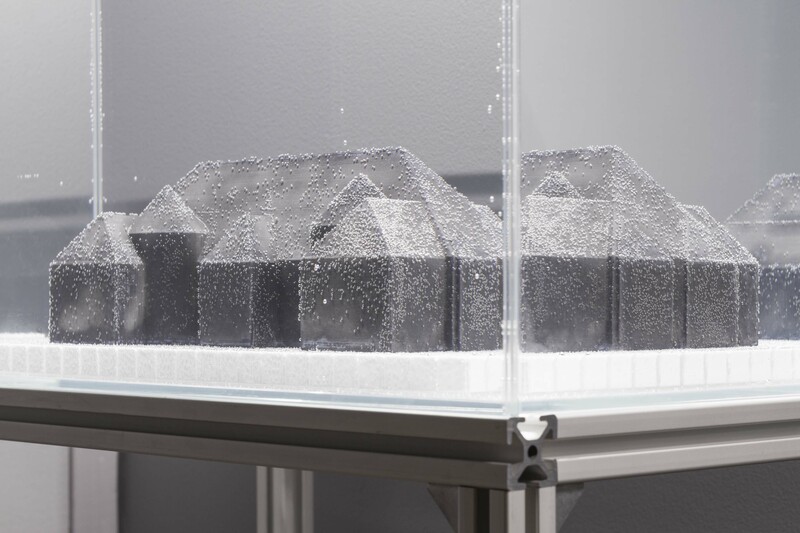 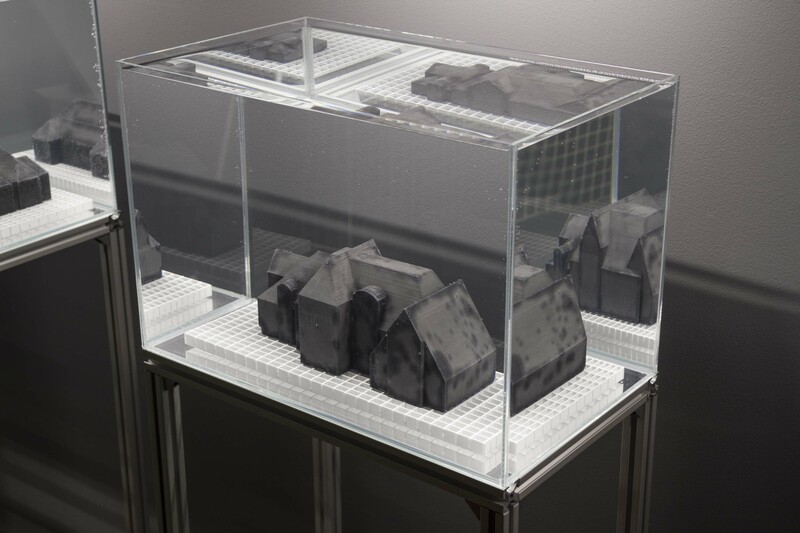 The series Mansions features concrete castings of architectural shapes displayed underwater inside small aquariums. 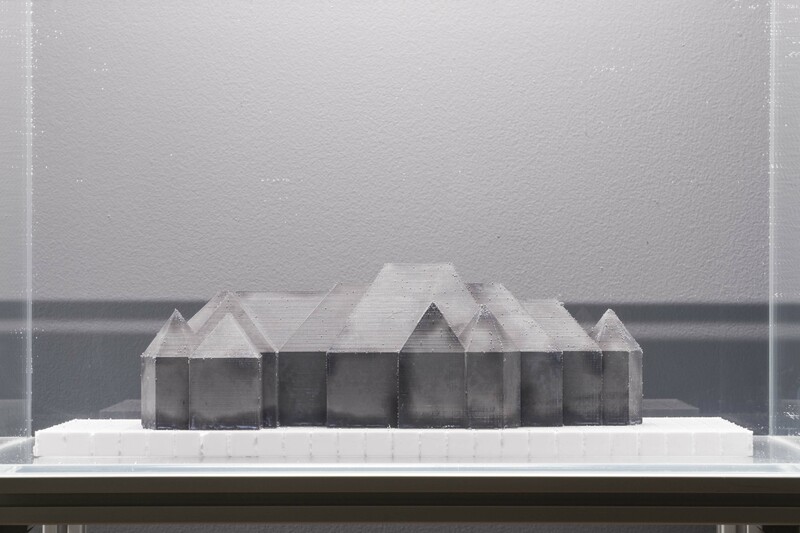 Each Mansion is a casted object borrowing its sculptural shape from a 3D model of a luxurious home found online, reduced to its most basic form as a dark sculptural shape. 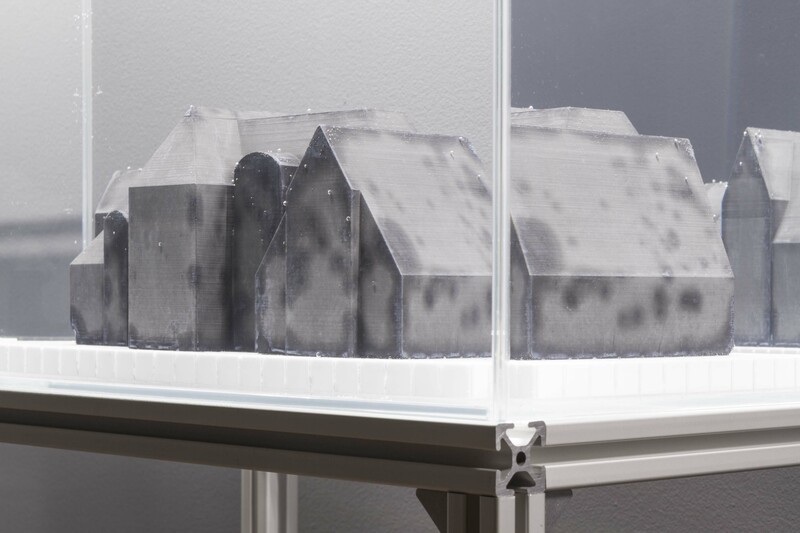 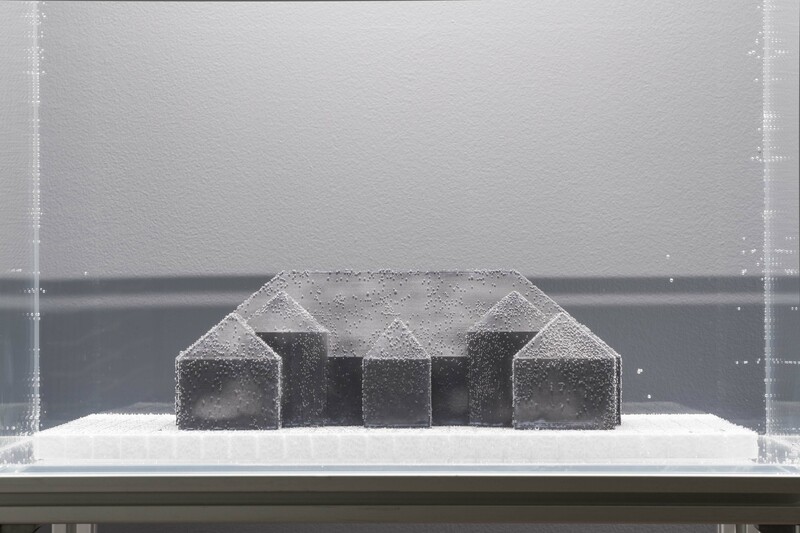 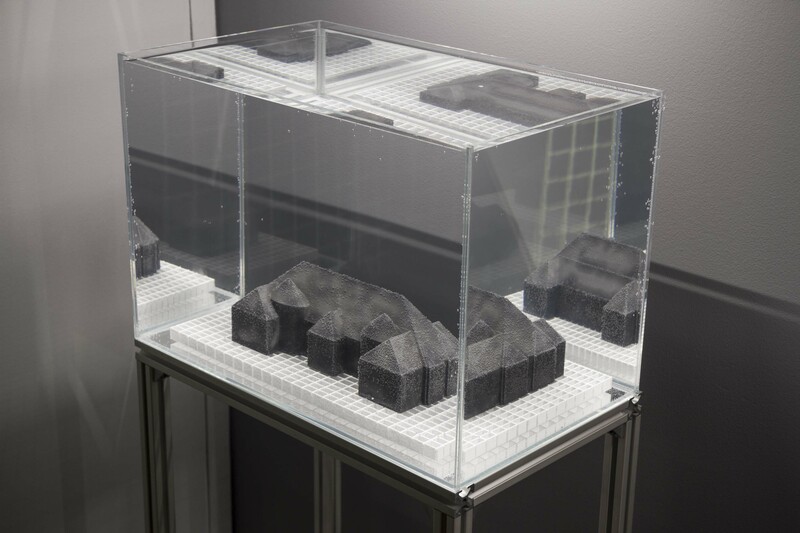 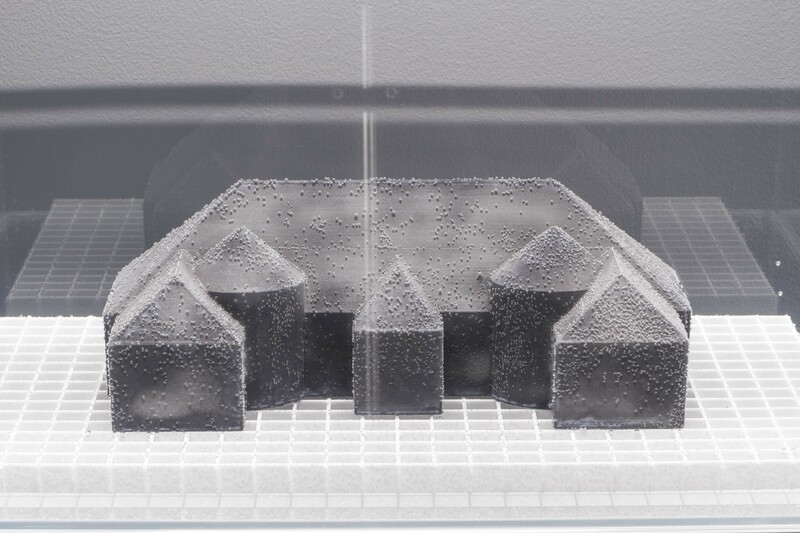 The 3D models are then 3D printed to produce a series of concrete castings submerged underwater. 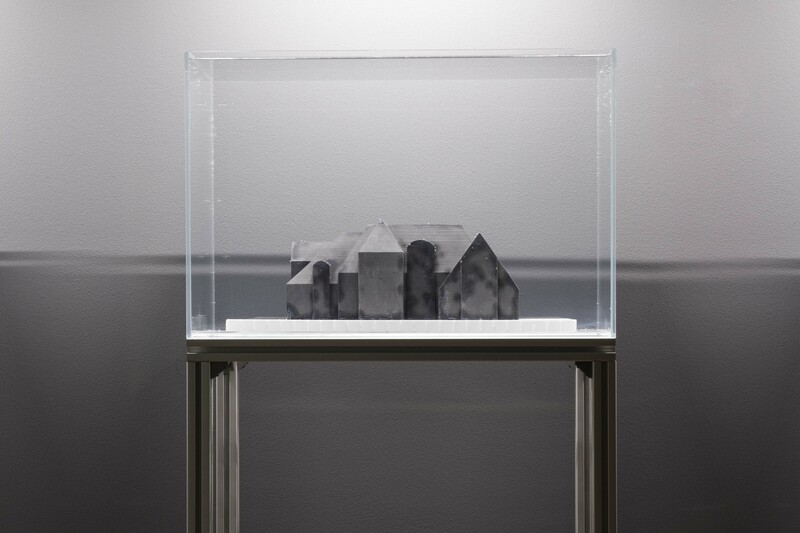 Mansions reflects on the notion of the dream home, its virtual existence and its unclear outcome as a virtual object. 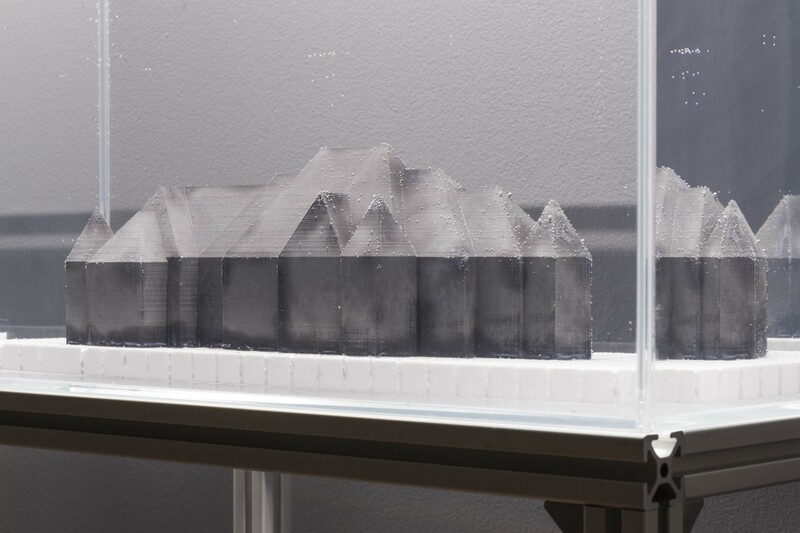 The project also aims to suggest parallels between the practice of 3D modelling and traditional art forms such as Suiseki, Bonsai and Saikei; contemplating on miniature sceneries and structures as domestic objects for contemplation. 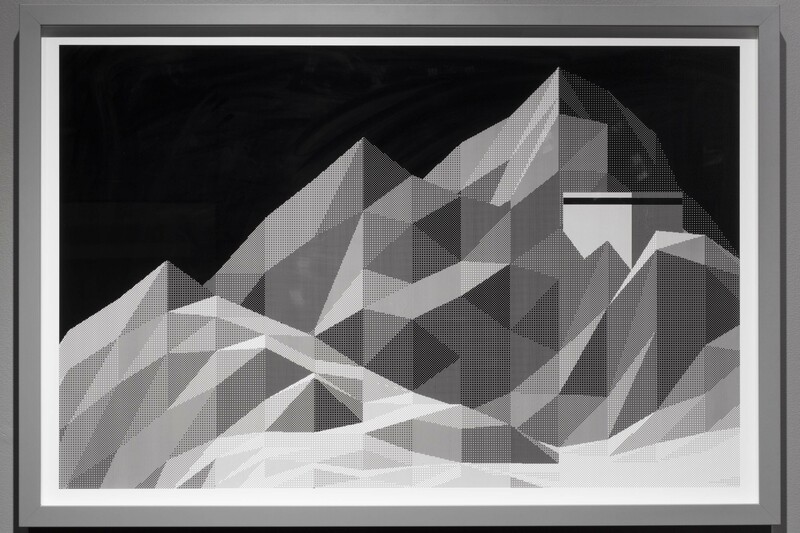 Veils is a series of computer-generated animations of window curtains agitated by a slight breeze. 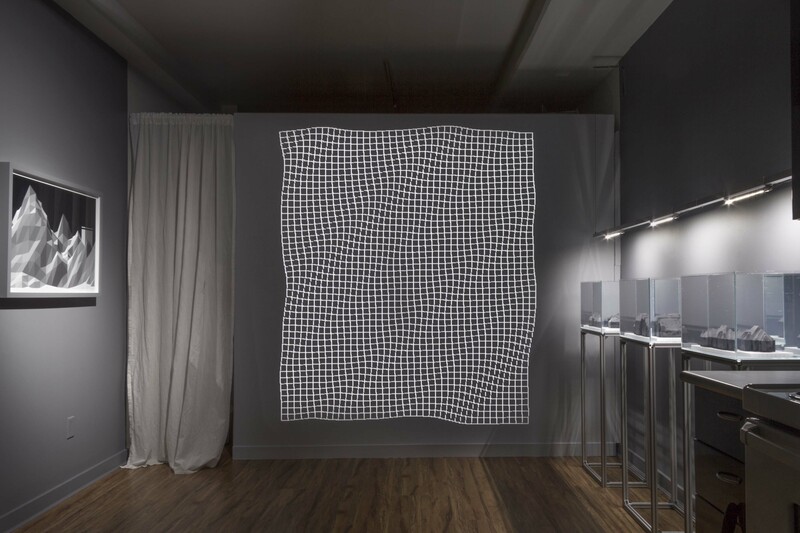 Each crochet-like curtain is framed by a dotted line of pixels delineating the borders of an imaginary window. 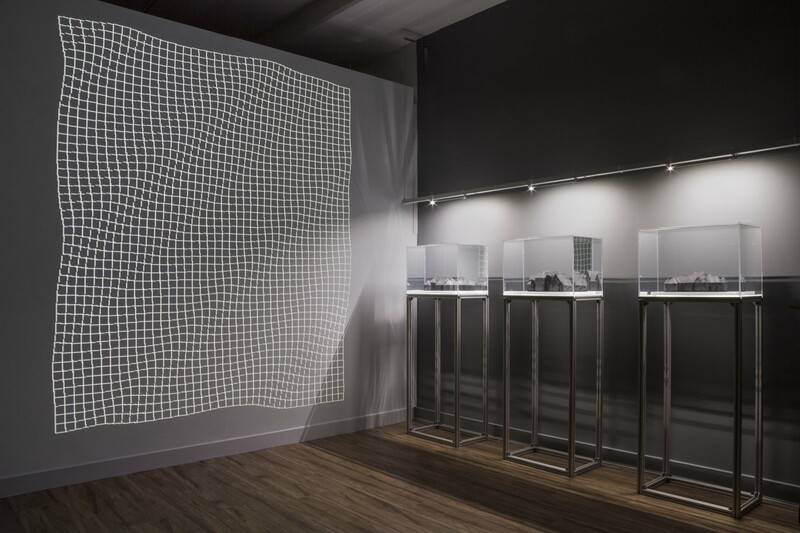 When projected, the animation transforms to a life-size architectural feature, evocating a passage way to the digital realm. 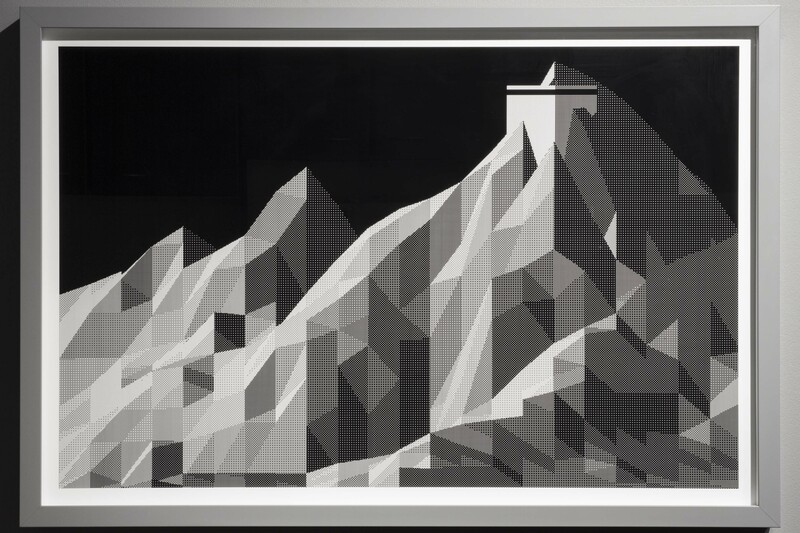 Nicolas Sassoon is a French-born artist living and working between Biarritz, France and Vancouver, BC. 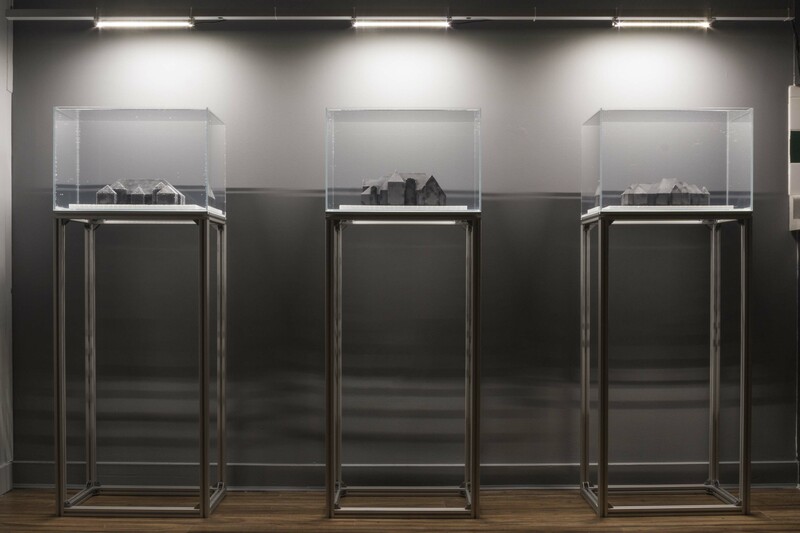 Sassoon’s work makes use of various computer-based processes to generate fantasized visions of architectures, landscapes and domestic environments. 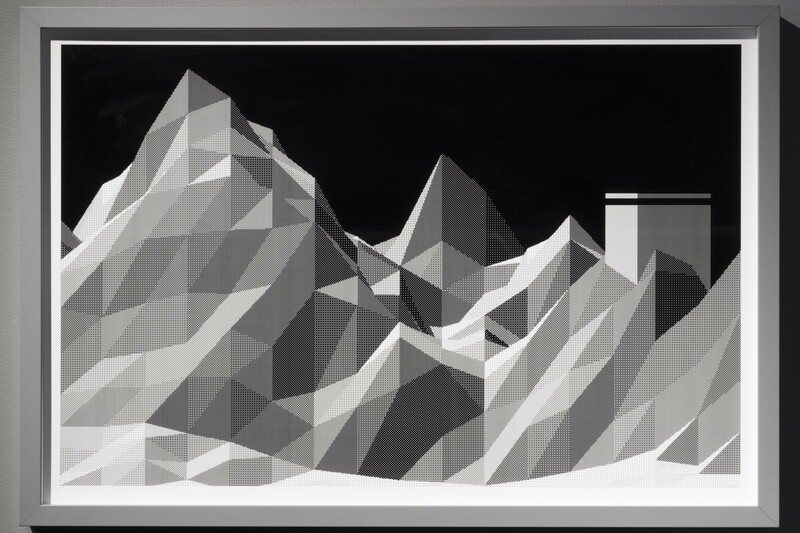 While most of his work is published online as animated GIFs, Sassoon also materializes his screen-based practice into sculptures, prints, textiles, and site-specific installations, as well as collaborations with other artists, architects, music producers and fashion designers. 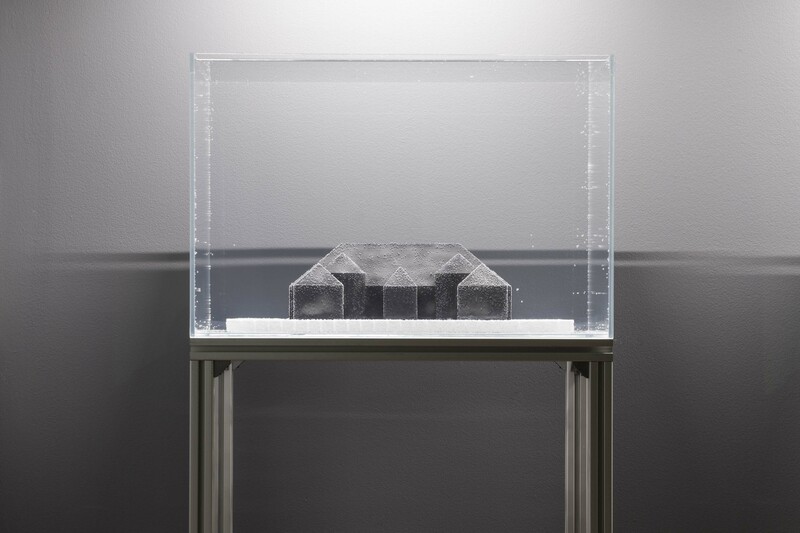 Sassoon’s work often explores the contemplative dimensions of the digital, as well as the manner in which virtual space can (or cannot) be inscribed within the physical realm. 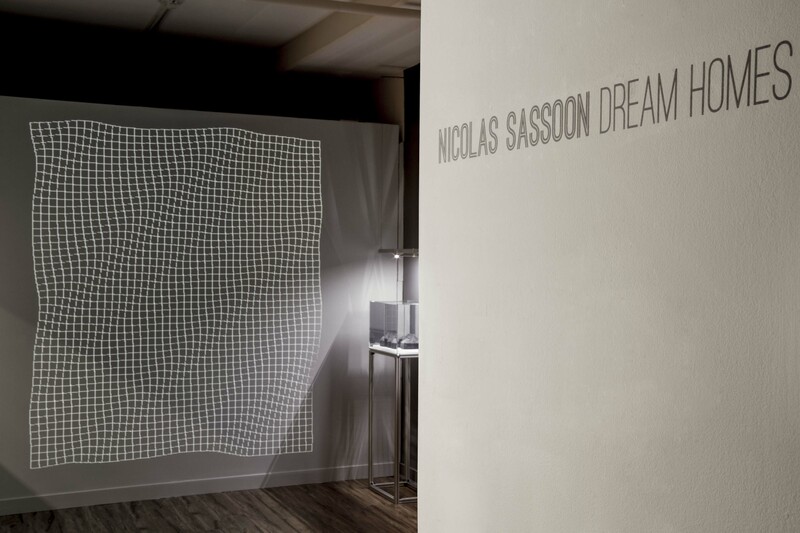 Nicolas Sassoon has previously exhibited his work at the Victoria & Albert Museum (UK), Today Art Museum(CN), New Museum(US), 319 Scholes(US), Eyebeam(US), May Gallery & Residency(US), Contemporary Art Gallery(CA), Charles H.Scott Gallery(CA), Western Front(CA), PRETEEN Gallery(MX), the Centre d’Art Bastille(FR), Arti et Amicitiae(NL), MU Eindhoven(NL) , the Berlin Fashion Week (DE)) and the New-York Fashion Week (US). 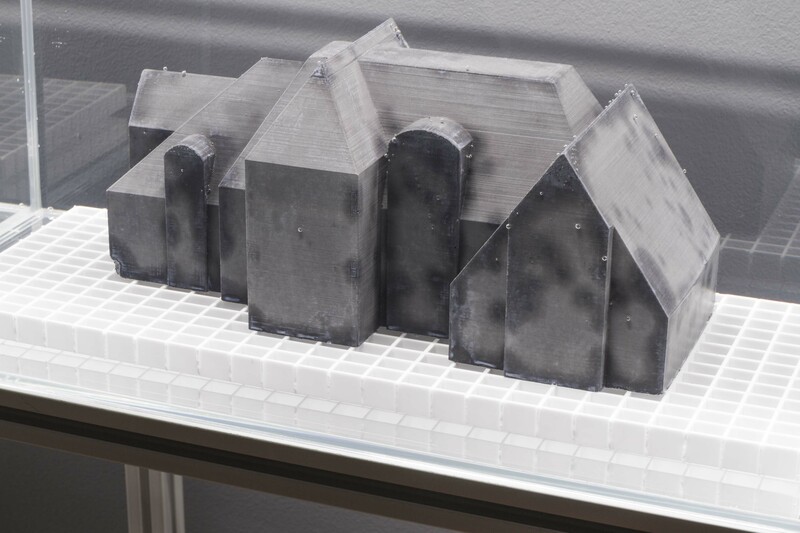 Nicolas is a member of the online collective Computers Club and a founder of the collective W-A-L-L-P-A-P-E-R-S.